As part of our goal to redefine the place of contemporary Africans in the world, and to foster understanding of African experiences and identities, Invisible Borders will embark on a project to publish a series of books for children ages 7 to 12. These books will tell about the histories and cultures of Africans, bringing some of the continent’s most significant, yet relatively unknown, figures and stories to the fore. 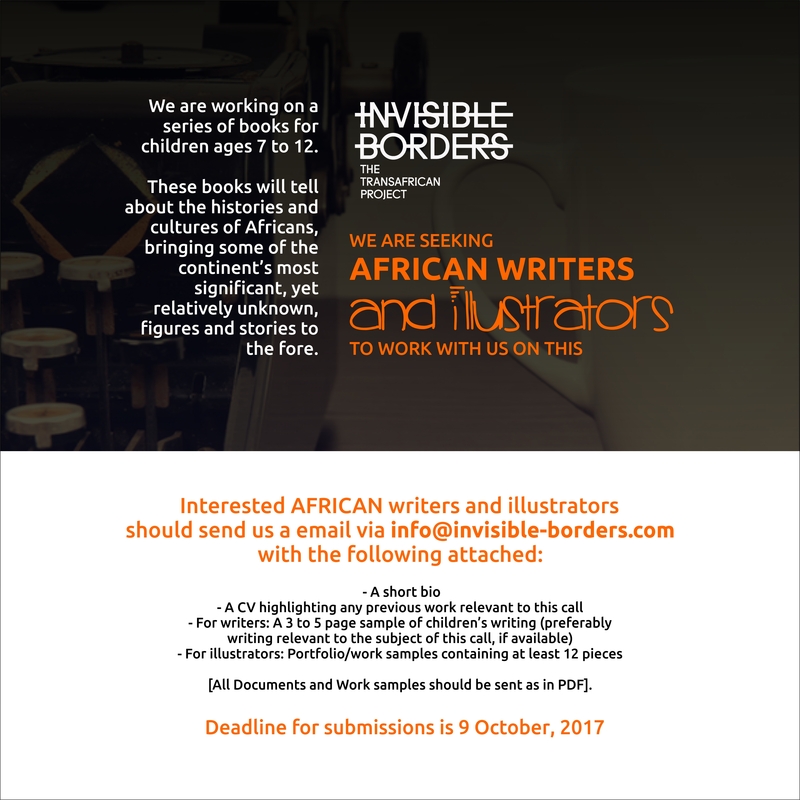 We are seeking African writers and illustrators to work with us on the first book in this project. The selected writer and illustrator will be paid for their work. The series will present fictionalized accounts of the lives and exploits of selected Africans, as well as stories of societies, civilizations and cultures within the context of Africa’s history. The series will feature colourful and engaging illustrations, with child-friendly and age-appropriate language. The target readership is primarily children of ages 7 to 12. The objective of this series is not to invoke a sense of nostalgia for or relive Africa’s past, but to show the connections between Africa’s past and its present, to illustrate how our history has influenced – and still does – our realities and perception of the world. Through this series, we aim to show the relevance of history and its crucial role in shaping who we are, to forge a meaningful relationship between our past and our present, and possibly project the future. The books in the series will be well-researched and will stay as true to fact as possible. However, the books will be written as fictionalized accounts, to allow for use of tools of fiction to tell engaging stories, as well as to grant creative license to protect young children from some of the violence and trauma that occurred in the real life versions. Our belief is that we will have achieved success if through this series we are able to sow curiosity in the minds of children about Africa and its history and stories, such that they grow up asking questions and seeking out obscure truths about their identities and place in the world. For writers: A 3 to 5 page sample of children’s writing (preferably writing relevant to the subject of this call, if available). For illustrators: Portfolio/work samples containing at least 12 pieces. Documents and illustrations should be sent in as PDF files. Deadline for submissions is October 9, 2017.